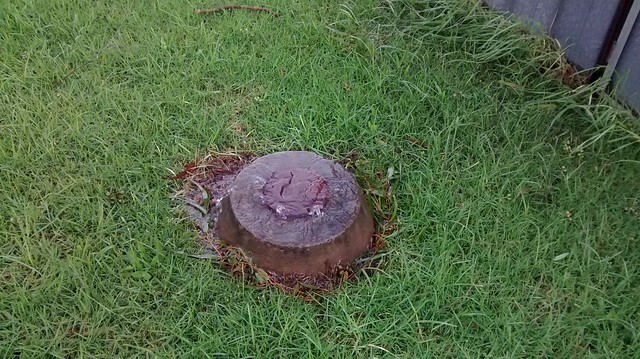 During the massive storms last month, along with floods, massive high tides, and branches coming down all over the place, our sewerage system got a little backed out – things were not draining properly, sinks and toilets threatened to overflow, and the sewerage drains in the backyard DID overflow (toilet paper in the yard was the proof!) I know it isn’t the most glamourous subject to write about, but blue loo!!! 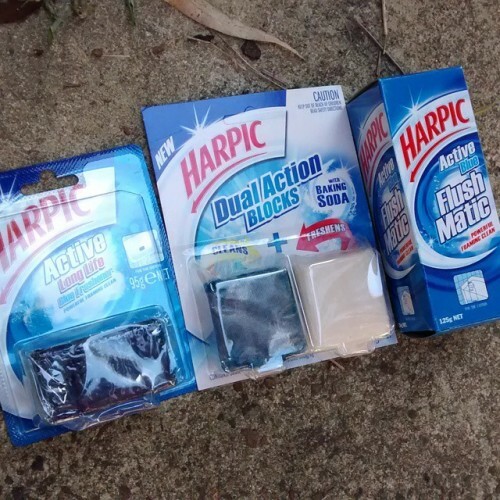 We pressure cleaned the outside paths and such, but the toilet needed something extra to reverse the smell and fortunately, I’d been sent a bunch of Harpic cleaning supplies to try out not long before! So, the long life blocks went to my sister, the dual action blocks went in our loo (Dad’s call). The two blocks are supposed to clean extra well with the baking soda of the white tablet, and the blueness of the blue tablet. They were easy to throw in the cistern, and it seemed to do the job… however not all that long lasting as the one I gave Jen, but that’s given me the chance to have the Flushmatic in the cistern and the Harpic Power Plus toilet cleaner in citrus (yeah, sucker for citrus). 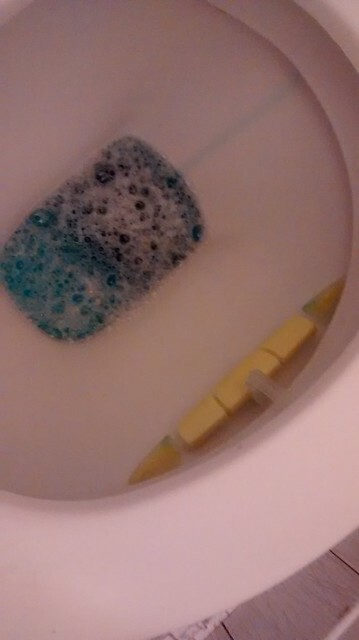 The Flushmatic was a little messy to mount, since I had to attach the twist-tie like hook to it, plus it has an open top… bit of scrubbing to get the blue off my fingers. The Power Plus was simple, it doesn’t sit curved against the bowl, but once I realised that was okay, I moved on with my life. Oh, the flushable wipes came a little later in my mailbox, but boy do they work! So, do you wanna try these products? Please answer the following question in the comments section and share via the means in the RaffleCopter for extra chances to win. The winner will be selected randomly, and entries close Monday May 25th. If toilet water could be a colour other than blue, what would you choose?